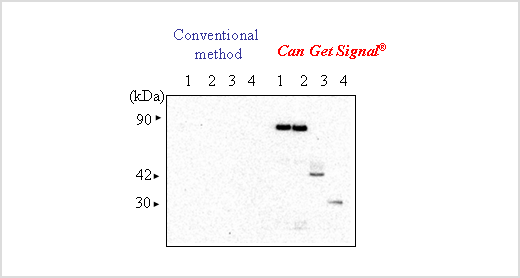 Can Get Signal® is a solution containing an accelerator for antigen-antibody reactions. This reagent improves sensitivity, specificity, and signal-to-noise ration (S/N) for Western blotting, dot blotting, enzyme-linked immunosorbent assay (ELISA), etc. Solutions 1 and 2 refer to the reactions of the primary and secondary antibodies, respectively. Enhances immunoassay signals up to several dozen times by maintaining low background signals. Can be used in combination with secondary antibodies labeled with peroxidase or alkaline phosphatase, etc. Can be used directly without dilution (ready-to-use). This kit includes the following components. All reagents should be stored at 4ºC, and protected from light. 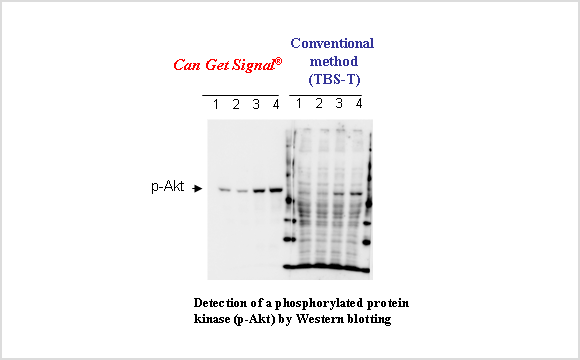 Phosphorylated Akt and ERK were detected by Western blotting analysis using Can Get Signal® and a conventional method (TBS-T). As a result, the signal intensities of the target bands obtained with Can Get Signal® were greater than those of the conventional method. The background level of the experiment with Can Get Signal® was also significantly lower than that of the conventional method. 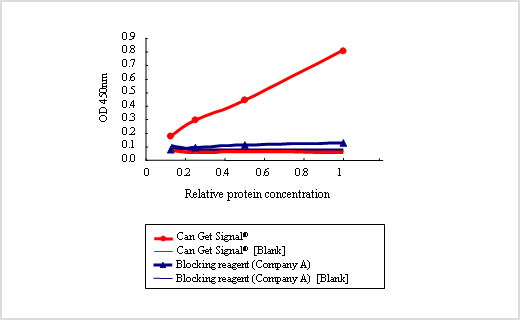 The results suggest that Can Get Signal® improves the sensitivity and specificity of Western blotting analysis. *The data was kindly provided by Dr. Yanagita from the Department of Pharmacology, Faculty of Medicine, University of Miyazaki. 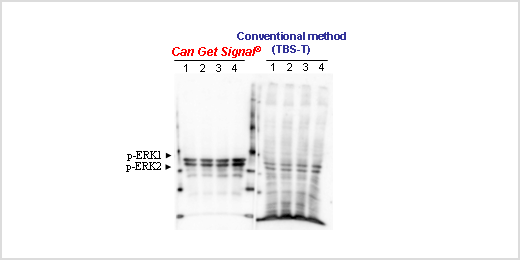 His-tagged recombinant proteins were detected with Can Get Signal® and a conventional method (TBS-T). Can Get Signal® showed excellent greater sensitivity than the conventional method. Sandwich ELISA (solid phase antibody: anti-ERK2 monoclonal antibody, primary antibody: anti-His tag polyclonal antibody, secondary antibody: anti-rabbit IgG-HRP antibody) was performed to detect his-tagged human MAP kinase (His-ERK2) synthesized by a cell-free protein synthesis system. 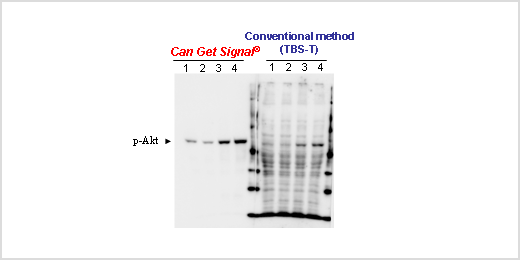 Can Get Signal® showed an excellent quantitative curve as a function of antigen concentration whereas the conventional method with TBS-T resulted in low signals.